Strawberries and cream! In a cookie! I’ve genuinely spent the last week trying (and failing) to get this white chocolate strawberry cookie recipe right. I really wanted to make a slice and bake cookie, but getting the balance between too sweet, too spready, and too yucky turned out to be a lot harder than expected. These hunks of yumminess taste like a cross between a vanilla sugar cookie, and a bowl of strawberries and cream. If Wimbledon was a cookie, this would be it. They are sweet, but not too sweet. The granulated sugar I rolled batch #2 in before baking did not go down well with Katie. But if you have a major sugar addiction, then have at it. 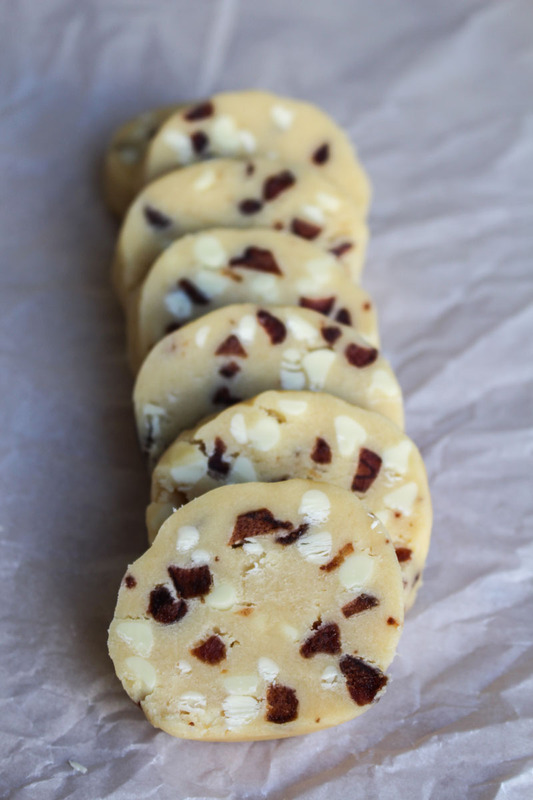 What I really love about these white chocolate strawberry cookies is that they hold their shape amazingly well. This is partly due to the lack of baking powder in them, which causes other types of cookie to rise and change shape when baking. The chilling, preferably overnight, also helps them to keep their shape when baking. 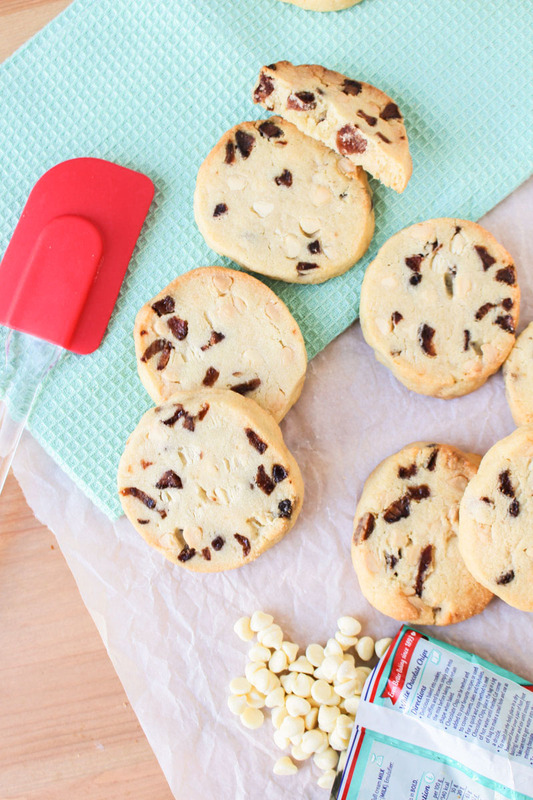 Don’t even think about skipping the refrigeration – you must chill these cookies before baking! If you are short for time, then try my no-chill double chocolate chip cookies – they are incredibly chocolatey, and will be ready to eat in less than an hour. The strawberry bits in these cookies comes from real life oven baked strawberries. I used Urban Fruit ones, which you pick up in any UK supermarket. Don’t use freeze-dried – you want them to feel squishy like Haribo. You will need to chop them up a bit, or you will run into some serious difficulty when slicing your cookie log later on. Just grab a pair of scissors and chop each strawberry piece into four. The amazing thing about slice and bake cookies, is that you can make the dough on Sunday, pop it in the fridge, and then bake the cookies later in the week when you need a bit of a pick-me-up. 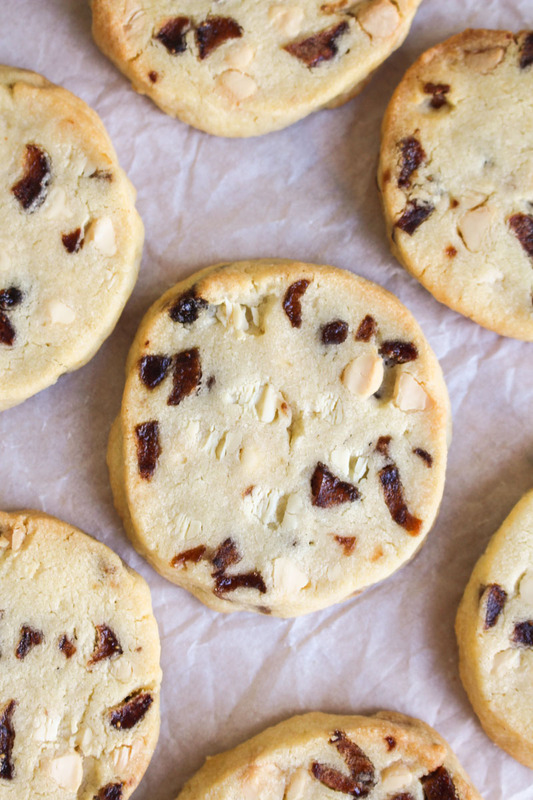 And is there anything that cheers you up more than freshly baked cookies? The dough itself is way too easy to make, all in one bowl. And there’s no rolling and cutting out either. If you want the lazy girl version of a sugar cookie, then you’ve found it. Just roll the freshly made dough into a log shape, wrap in clingfilm, and refrigerate for at least four hours. But yes, overnight is best. When it comes to baking time, unwrap the log, slice up into 14-16 cookies, and then bake for just under a quarter of an hour. And that’s really it. Now that I’ve successfully achieved my white chocolate strawberry cookie goals, I think it’s time to get back in the kitchen and play around with our new ice cream maker… Wedding presents are the best. Strawberries and Cream in cookie form. If Wimbledon were a biscuit, this would be it. Beat the butter using a hand or stand mixer until creamy and soft. Add the sugar, and beat well until the sugar is fully incorporated. Add the egg yolks one at a time, beating well between each addition. Add the vanilla extract, and beat again. Add the flour, salt, strawberries pieces, and white chocolate chips into the bowl, and mix gently on the lowest setting, until just combined. You do not want to over-mix, as this will result in a tougher cookie. Place the cookie dough on a floured work surface, and roll out into a log using your hands. The longer the log, the smaller your finished cookies will be. I rolled the log about 30cm (12 inches) long. Wrap the dough log in clingfilm or plastic wrap, and place in the fridge for at least four hours. Leaving to chill overnight is best. The cookie dough will keep in the fridge for 3-4 days. When ready to bake, preheat the oven to 180°C / 350ºF (160°C fan). Line a couple of baking sheets with grease proof paper or baking parchment - there is no need to grease. Once the oven is hot enough, remove the dough log from the fridge and cut into approximately 16 slices. Place the slices on the baking sheets and bake for 12-14 minutes, until golden brown around the edges. Leave to cool on the baking sheets for 10 minutes, and then transfer to a wire rack to cool completely. The unbaked dough logs will keep for 3-4 days if wrapped in cling film and stored in the fridge. The unbaked dough can also be frozen for up to 3 months - defrost in the fridge overnight before baking. The baked cookies will stay fresh for 3-4 days if kept in an airtight container. These cookies are amazing. Batch 1 and batch 3 were both perfect tbh. They are quite sweet but I really like them! You could eat some while watching the Olympic tennis and pretend that it’s Wimbledon? 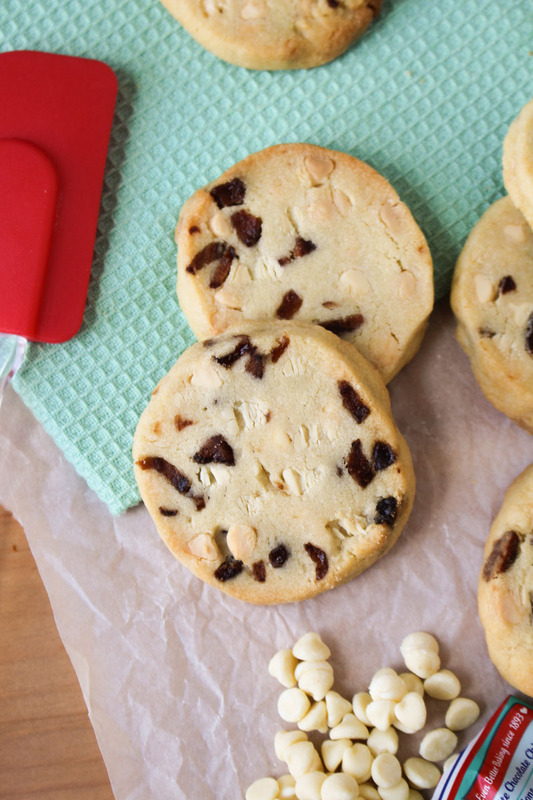 Your hard work clearly paid off — these cookies look and sound amazing! I hope your week has turned around now! Thanks Sam 🙂 Yes – things are looking up!